Heartbroken family friends of Sheffield student Caroline Everest have spoken of their sadness at the discovery of a woman’s body in a city river this morning. Police officers searching for missing Caroline Everest, who vanished after a night out in Sheffield over the weekend, found a woman’s body in the River Porter, off Summerfield Street, at the bottom of Ecclesall Road, earlier today. The body has not yet been formally identified, but South Yorkshire Police said it is believed to be Caroline. Her relatives have been informed of the discovery and are being supported by specially trained officers. Caroline, a student at Sheffield Hallam University, vanished after she left the Corporation nightclub in Milton Street, Sheffield city centre, in the early hours of Sunday. 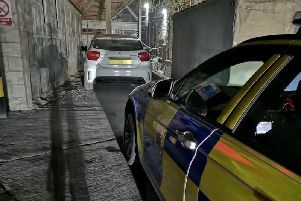 Police officers spent yesterday trawling through hours of CCTV footage from in and around the city centre to try to track Caroline’s movements after she left the nightclub at 2.40am. Police want to hear from anyone who saw her after she left the club. She was wearing a black dress with a black cardigan and was carrying a black handbag with a cream strap when she went missing. Alexandra Edge said Caroline was a ‘kind, lovely girl’ who ‘wouldn’t harm a fly’. Posting on her mum Val Harding’s Facebook page, friends today expressed their shock and sadness at the discovery of a body. A spokesperson for Sheffield Hallam University said: “We are deeply shocked and saddened to hear that South Yorkshire Police have today found a body that they believe to be Caroline Everest. “Our thoughts at this time are with Caroline’s family and close friends, and we are offering support to our students and staff. Corporation this afternoon posted this statement on their Facebook page: “We are deeply saddened to hear the news about Caroline who was a regular customer here at Corporation. “She was a wonderfully friendly and lively person and will be greatly missed by us all here. “Our thoughts at this time are with her family and friends.